Posted by ajoyfulpractice in 108 Sun Salutations, Books, Buddhism, Changing Perspectives, Faith, Fitness, Health, Hope, Japa, Japa-Ajapa, Karma, Mala, Mantra, Meditation, Minneapolis, Minnesota, Music, New Year, Philosophy, Science, Suffering, Surya Namaskar, Twin Cities, Writing, Yoga. If your computer, iPod, Cd player, or other music maker is on repeat – and you’re listening to D. J. Shadow’s debut album – the end is the beginning, and the last words are prophetic. Sometimes when I play this song in class, everything syncs up and we are starting the second side of a challenging sequence: so, we are at the beginning, the end, and the middle – and the words are highly prophetic. Last year, as I prepared to lead 108 Sun Salutations for New Year’s Day, I realized everything was syncing up: we were at the end of one year, the beginning of a new year, and in the middle of a week – and I was getting ready to do 108 Sun Salutations three (count them, 3!!!) times. Suddenly, D. J. Shadow’s chuckle was highly prophetic. But, the fact that I counted out 324 Sun Salutations – and that several people (myself included) spent part of New Year’s Day thinking D. J. Shadow’s highly prophetic words with utter disbelief – isn’t what started me thinking this song should be one of our 2014 theme songs. No, my reasoning was a little deeper than that. We just can’t seem to help ourselves. On the mat, we find our thoughts involuntarily wandering to situations and people seemingly out of context. Try as hard as we might to stay focused on the here and now – as opposed to that arbitrary thing that happened in 1979, with that person who shall remain nameless – our mind seems to have, well, a mind of its own. It goes back again, and again, and again, like a random paragraph from Swann’s Way. Somatically speaking, such thoughts may not be as random as they appear. Yoga teaches us that we hold our experiences in our bodies. So, it stands to reason, when we’re working the body we are also working though our years. The physical practice sometimes becomes a practice of systematic reflection. Pose-wise, we often move from Child’s Pose (Balasana) or Corpse Pose (Savasana); through the approximation of learning to stand and walk – think Table Pose to Downward Facing Dog (Adho Mukha Svanasana) to Forward Fold (Uttanasana) to Equal Standing/Mountain Pose (Samasthiti/Tadasana) (video); then we explore and play; until we slow down, move into Corpse Pose (Savasana), and ultimately roll over to start all over again. Energy-wise, we typically move from our childhood (first chakra/wheel), through our developmental stages (second and third chakras/wheels), into our “maturity” stages (fourth and fifth chakras/wheels), and then to the unknown that lies beyond (sixth and seventh chakras/wheels). But, even people who don’t practice yoga spend a fair amount of time reflecting on their lives. At the beginning and end of a year, right around our birthdays, whenever we experience one of life’s big milestones, and/or when the seasons change, we think about where we’ve been and where we’re going. Making resolutions (or just good old-fashioned planning) seems like a natural part of this reflection process, because as long as we are are actually living there is some part of us wanting to learn and grow. Yet, a good portion of us will get stuck thinking about the past, and approximately 80% of us will set goals we won’t achieve – which, at some point will have us lamenting the past. Perhaps equally significant is the fact that regardless of when we celebrate a new year or a birthday – or even observe the changing of the seasons – we will almost always find ourselves in situations we’ve dealt with in the past. The wise old wives tell us we’ll repeat the same situations until we learn the lessons. And, let’s be honest, sometimes we’re that kid who keeps failing the class. What the wise old wives don’t tell us is that we can move on to the next grade, but we’re still going to be struggling with the same material. We can blame our (master) teachers, we can blame life, we can even blame the wise old wives; however, at some point we need to cowboy (or cowgirl) up and take responsibility for being where you are. Karma is a word we throw around, sometimes without really thinking about what it literally means. We focus on the idea of destiny, fate, or retribution and reward. However, karma is the Sanskrit word for work, action, deed. It is everything we think, say, and do. Obviously, one way to think about karma is in the context of reincarnation. But, what if you don’t believe in reincarnation or the idea that you will keep living lives until you live (or get it) “right” – whatever that means? Have you considered what happens if you just look at this life you’re living and the ramifications of the work/karma you’re doing? Have you considered the fact that everything you think, say, do in this moment leads to another thought, word, and deed in the next moment? 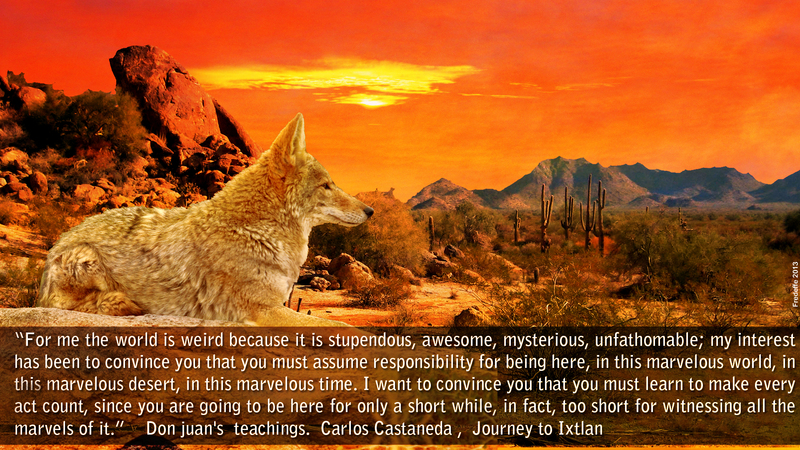 Look back at that last link where Don Juan speaks to Carlos Castaneda in Journey to Ixtlan. So, in that interest, have you assumed responsibility for being here? At some point, on or off the mat, we all want to skip to the end and reap our rewards. We want to ignore the seemingly random thoughts and sensations so we can get to the good stuff. We want, not only a passing grade, but all the accolades which come with it. We want, not only what we’ve earned, but also what we desire. And, at some point, on and off the mat, we are confronted with….what we’ve already done. I started this post on January 3rd (2014). It was intended as a “sample” of themes and motifs for the year (2014). But, the year got away from me – and this post sat over in the draft column…waiting to see if I’d dust it off and update it. Or, if I’d just trash it. I’d like to say it was waiting patiently. But, that’s not how my mind works. So, sometimes, it was taunting me. Other times it was encouraging me. Finally, it was speaking to me. Not surprisingly, a year later (to the date) it sounds a lot like D. J. Shadow….